To Cite: Golestani Eraghi M, Pourabdollah Toutkaboni M, Farzanegan B, Marjani M, Hashemian S M R, et al. Antifungal Resistant Gastrointestinal Basidiobolomycosis Without Eosinophilia: A Case Report, Arch Clin Infect Dis. 2017 ; 12(4):e66110. doi: 10.5812/archcid.66110. Introduction: Gastrointestinal basidiobolomycosis (GIB) is an emerging fatal infection in healthy individuals with limited known signs and symptoms. Case Presentation: A 42 years old labor man was admitted to the intensive care unit (ICU) of Masih Daneshvari hospital, Tehran, Iran, with chronic abdominal pain, a fever, and suspicion to post-operative abdominal infection. The patient had undergone an appendectomy as well as a colorectal surgery and a colostomy had been placed. The histopathological study of the colon was identical for gastrointestinal basidiobolomycosis. There was no eosinophilia in the peripheral blood sample. Patients’ treatment using itraconazole, voriconazole, and amphotericin B was not successful and unfortunately, he died because of septic shock. Conclusions: GIB is an emerging and fatal fungal infection with non-specific presentation such as abdominal pain, mass, and fever in healthy individuals. Persistent leukocytosis with or without eosinophilia, resistant fever, and other signs and symptoms after surgical resection, patients job and residents are important clue and insert the basidiobolomycosis in list of differential diagnoses is most important factor to early diagnosis and treatment. Basidiobolomycosis is a rare fungal infection caused by Basidiobolus ranarum, an environmental saprophyte of the subphylum Entomopthoromycotina. It was classified in a family of Zygomycota (1). Subcutaneous involvement is the most common type of Basidiobolus ranarum infection, which originates mostly in the tropical areas of South America, Africa, and Asia; in addition, it mostly affects young healthy males (2, 3). Local inoculation, minor trauma, and insect bites are a usual acquisition route of subcutaneous infection (3, 4). Basidiobolomycosis can rarely be detected in other parts of body such as gastrointestinal tract (5). Visceral infection with Basidiobolus is rare and from our knowledge, 71 patients were reported with gastrointestinal involvement worldwide, all of them being immune competent (6). There are limited numbers of sporadic case reports of gastrointestinal involvement; therefore, report of any minor signs and symptoms is essential (7). Abdominal pain is the most common symptom of gastrointestinal basidiobolomycosis (GIB). Abdominal mass, constipation, abdominal distension, fever, weight loss, diarrhea, vomiting, lower GI bleeding, and hepatomegaly are other manifestations of GIB, which are usual symptoms of many of the GI tract diseases. Itraconazole is the most antifungal agent used to treat GIB and vericonazole is an effective antifungal drug to treat resistant patients. We report a patient with vericonazole resistant-GIB, septic shock, and death in the present case report. A 42-year-old Iranian man, originally from Bandar Abas province, Islamic Republic of Iran, was admitted to the intensive care unit (ICU) of Masih Daneshvari hospital, Tehran, Iran, with suspicion to post-operative abdominal infection. The patient had a past history of an appendectomy in another hospital due to abdominal pain and a fever 2 months before admission. Due to any post-appendectomy clinical improvement and chronic abdominal pain, diagnostic abdominal laparoscopy had been performed 10 days after first surgery, which had shown multiple abdominal masses around the ascending colon. A laparotomy and colostomy had been performed on the patient with suspicion to colon malignancy. Histopathological study of the colon had shown severely inflamed, congested, and a partially necrotic intestinal wall, as well as fungal structures, broad septate thin walled fungal hyphae, which was compatible with gastrointestinal basidiobolomycosis (which was confirmed by another pathologist in our hospital) (Figure 1). Itraconazole 200 mg PO q8hr had been administered immediately and the patient was referred to our hospital for more workup as well as ICU admission due to clinical worsening. There was no result of the other laboratory assessment. In our center on admission day, there was peri-umbilical abdominal pain and tenderness, bilateral reduced respiratory sound, basal bilateral rhonchi in lung auscultation, and moderate lower extremity pitting edema, without fever, shaking, nausea, or vomiting in clinical assessment. The hemodynamic status was stable and O2 saturation was about 98%. He had construction labor and mentioned gross hematuria. The patient had a left chest tube with transudative-like fluid discharge. 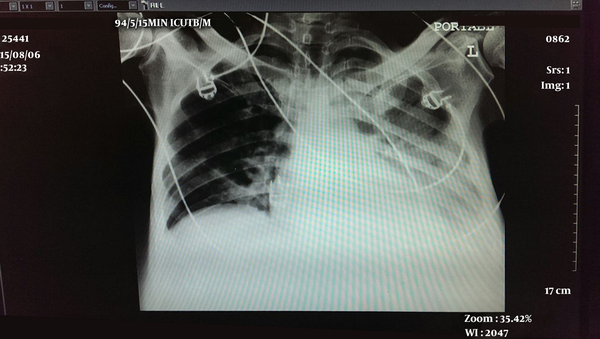 The chest X-ray was remarkable for basal plural effusion (Figure 2). His laboratory workup showed the following: white blood cell (WBCS) 20100 mm-3, neutrophils 91% and eosinophil 0%, haemoglobin 10.9 g/dL, platelet 84 ×103 mm-3, ESR 43 mm/h, C- reactive protein (CRP) 21 mg/dL, AST 43 IU/Lit and normal renal function. Immunoglobulin (Ig) A, G as well as M were normal, and Ig E (ELIZA) was higher than normal (256 IU/mL). Serum level of albumin was lower than normal (2.1 g/dL). Procalcitonin increased during 24 hours from 10.8 to 54. Fluid culture of chest tube discharge showed acinetobacter baumanii. The patient was treated by meropenem 2 mg/q8h and colistin 4 MU bolus and every 6 hours. Gastrointestinal basidiobolomycosis treatment using itraconazole was continued, however, there was clinical worsening. NBT-reducing neutrophils test was done, which was 99% (normal) therefore, we changed the medication to itraconazole 200 mg PO q8hr (for 3 days, then 200 mg q12hr), amphotericin B liposomal 350 mg IV qday, and voriconazole 400 mg IV q12hr (for first 24 hours, then 200 mg IV q12hr); however septic shock and hemodynamics instability finally occurred but unfortunately caused the patient to die 13 days after the first admission in the first hospital. Basidiobolomycosis is a rare fungal infection caused by Basidiobolus ranarum (1) and originates mostly in tropical areas, especially in the United States and Saudi Arabia (2, 3). There are limited numbers of sporadic case reports of gastrointestinal involvement, therefore, a report of any minor signs and symptoms is essential (7). Nearly all 71 reported cases are immunocompetent with non-specific presentations such as abdominal pain or mass and fever, which mimics infectious GI tract disease or tumors (7). Colorectal is the most common site of involvement and malignancies are the most common diagnosis (8). Due to no definite and characteristic clinical presentation of GIB, all previous reported cases have been operated without initial diagnosis of GIB. The preoperative diagnosis included different neoplastic and non-neoplastic diseases such as colorectal cancer, Crohn’s disease, and inflammatory pseudo tumor (6). 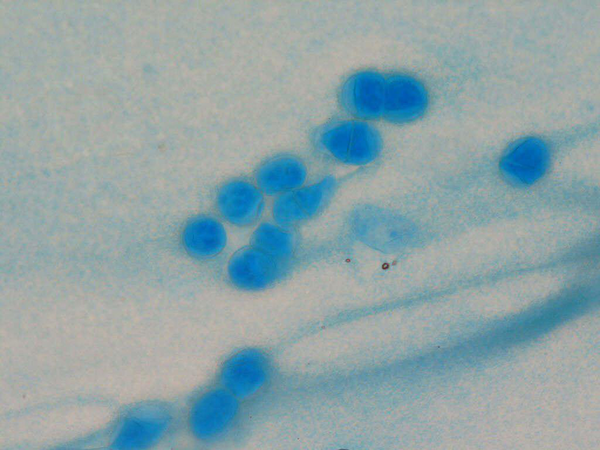 The opposite of many fungal infections, basidiobolomycosis was seen in immunocompetent individuals of tropical or subtropical areas. Therefore, precise and early diagnosis is needed for a high index of suspicion. Peripheral blood eosinophilia is common (76% of reported patients) in the laboratory assessment and characteristic of the histopathological feature is the diagnostic key and culture is gold standard (6, 9). Eosinophilia was not seen in our case, which is the opposite of previously reported patients. He was constructor labor in tropical climate, which could be a good clue in the base of high suspicion to fungal infections. There is no standard treatment for GIB, however, it seems that the initiation of the combination of surgery and prolonged antifungal treatment is essential based on the patient’s clinical situation and involved site (8). Itraconazole is the most common antifungal treatment (73%), then amphotericin (22%), ketoconazole (8%), and voriconazole (5%) (8). Our patient underwent an appendectomy, laparotomy as well as colectomy, associated colostomy, and received itraconazole 200 mg IV q8hr for 13 days immediately after pathological diagnosis of GIB followed by amphotericin B liposomal 350 mg IV qDay and vericonazole 400 mg IV q12hr (for first 24 hours, then 200 mg IV q12hr) for 11 days, however, unfortunately it was not effective. There is no evidence of invasion of Basidiobolus ranarum to vessels and blood (6). Our patient had plural fluid infection by acinetobacter, which was treated by meropenem and colistin. Since colostomy-induced hypoalbuminemia, he had moderate lower extremity pitting edema. Due to of itraconazole resistant GIB, NBT-reducing neutrophils test was done with suspicion to neutrophil-associated immune deficiency, however, it was normal, so we added voriconazole and amphotericin B. We did not check the blood sample for fungus dissemination and its in vitro response to antifungal medication, therefore, we could not discuss fungus resistance as a fatal factor or other clinical complications (such as pleuritic infection, abdominal infection). GIB is an emerging and fatal fungal infection with non-specific presentation such as abdominal pain, mass, and fever in healthy individuals. Persistent leukocytosis with or without eosinophilia, resistant fever and other signs and symptoms after surgical resection such as the patients job and residents are an important clue and inserting the basidiobolomycosis in list of differential diagnosis is the most important factor to an early diagnosis and treatment. 1. Kontoyiannis DP, Lewis RE. Agents of mucormycosis and entomophthoramycosis. In: Mandell GL, Bennett JE, Dolin R, editors. Mandell, douglas and bennetts principles and practices of infectious diseases. Philadelphia: Elsevier; 2010. p. 3257-69. doi: 10.1016/b978-0-443-06839-3.00259-9. 2. Maiti PK, Bose R, Bandyopadhyay S, Bhattacharya S, Dey JB, Ray A. Entomophthoromycosis in South Bengal (Eastern India): a 9 years study. Indian J Pathol Microbiol. 2004;47(2):295-7. [PubMed: 16295506]. 3. Sujatha S, Sheeladevi C, Khyriem AB, Parija SC, Thappa DM. Subcutaneous zygomycosis caused by Basidiobolus ranarum - a case report. Indian J Med Microbiol. 2003;21(3):205-6. [PubMed: 17643022]. 4. Bittencourt AL, Marback R, Nossa LM. Mucocutaneous entomophthoramycosis acquired by conjunctival inoculation of the fungus. Am J Trop Med Hyg. 2006;75(5):936-8. [PubMed: 17123991]. 5. Nemenqani D, Yaqoob N, Khoja H, Al Saif O, Amra NK, Amr SS. Gastrointestinal basidiobolomycosis, an unusual fungal infection mimicking colon cancer. Arch Pathol Lab Med. 2009;133(12):1938-42. doi: 10.1043/1543-2165-133.12.1938. [PubMed: 19961248]. 6. Geramizadeh B, Heidari M, Shekarkhar G. Gastrointestinal Basidiobolomycosis, a Rare and Under-diagnosed Fungal Infection in Immunocompetent Hosts: A Review Article. Iran J Med Sci. 2015;40(2):90-7. [PubMed: 25821287]. 7. Al Naemi AQ, Khan LA, Al Naemi I, Amin K, Athlawy YA, Awad A, et al. A case report of gastrointestinal basidiobolomycosis treated with voriconazole, a rare emerging entity. Medicine, (Baltimore). 2015;94(35):1430. doi: 10.1097/MD.0000000000001430. [PubMed: 26334903]. 8. Vikram HR, Smilack JD, Leighton JA, Crowell MD, De Petris G. Emergence of gastrointestinal basidiobolomycosis in the United States, with a review of worldwide cases. Clin Infect Dis. 2012;54(12):1685-91. doi: 10.1093/cid/cis250. [PubMed: 22441651]. 9. El Shabrawi MH, Kamal NM, Kaerger K, Voigt K. Diagnosis of gastrointestinal basidiobolomycosis, a mini review. Mycoses. 2014;57 Suppl 3:138-43. doi: 10.1111/myc.12231. [PubMed: 25186791].